These Persian fishcakes are full of herbs and make a delicious starter or light lunch. They can be made up in advance and cooked when you need them. Wine Suggestion: the only option here is a youthful, light, off-dry Riesling where the aromatics, herbs, date and tamarind all play with each other. Tonight we drank the Dr Loosen Estate Riesling, his entry level wine made with his own fruit in the Mosel and it was an excellent match. Along with the Mosel we’d recommend the fruity styles (Kabinett & Spätlese) from other German regions such as the Nahe and Rheingau. Further afield the Aussie Rieslings tend to be too dry for a dish like this but there are some excellent NZ examples, Forrest Estate and Felton Rd spring to mind. Put the potatoes into a large pan and cover with cold water. Add a generous pinch of salt and bring to the boil, then simmer until tender. Drain, mash the potatoes, and put into a large mixing bowl. Add the fish to the potatoes. Dry fry the cumin seeds in a small frying pan for a minute or until fragrant. Grind the seeds with a pestle and mortar, then add to the bowl along with the fresh herbs, fenugreek leaf, garlic, cayenne, turmeric, lemon zest, egg, 1¼ tsp of salt and ¼ tsp of pepper. Mix well with your hands, then shape into eight round patties. Dust with a little flour and place on a plate, cover with cling film and chill. To make the sauce, put the tamarind and its soaking liquid, the dates, brown sugar, cayenne, cinnamon and a pinch of salt in a small saucepan. Add the hot water and cook for 10 minutes over a low heat until the dates are very soft. Take the sauce off the heat and sieve into a bowl, use the back of a spoon to rub as much through as possible. To finish the fishcakes, heat the oil in a frying pan and cook the cakes on a medium-high heat for 6-8 minutes, turning every few minutes, until golden brown and crusted. Garnish with parsley and serve with the sauce. We made this when we visited Australia earlier this year from a great cookbook by Stephanie Alexander, her Kitchen Garden Companion. 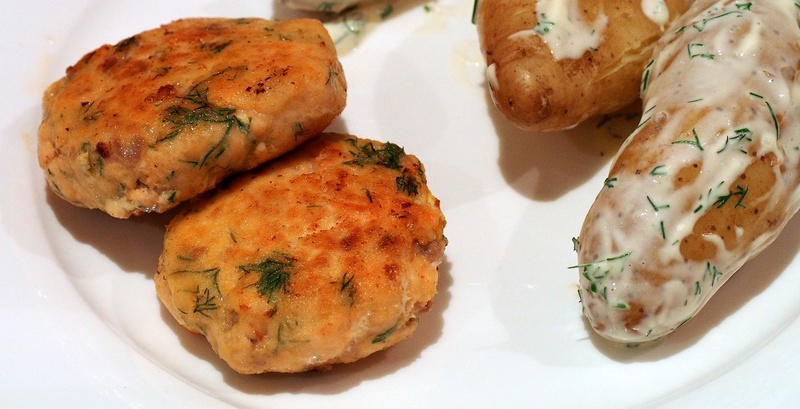 They go great with some new potatoes tossed with sour cream and dill for a main course. Pour the cream over the breadcrumbs and leave to soak for 5 minutes. Pulse the salmon, cream-soaked crumbs and goat’s cheese in a food processor until combined, but not reduced to a paste. Scrape the mixture into a mixing bowl and mix in egg yolk and dill, then season with the salt and some pepper. Cover with cling film and chill for 30 minutes. Wet your hands and divide the mixture into 8 large or 24 bite-sized fishcakes. Roll the fishcakes in the flour. Heat butter and oil in a large non-stick frying pan over medium heat and fry the fishcakes for 2-3 minutes per side or until golden brown. Be careful not to overcook as they are better if they stay a bit moist. Wine Suggestion: Try to find a top-quality Australian Verdelho, with a few years of age on it. It should have mellowed and developed a honey character alongside the fresh acidity and white floral character.